ScubaPro Holiday 2014 - Bluewater Scuba - "Where Nashville Learns To Dive"
Buy any premium SCUBAPRO regulator AND a premium SCUBAPRO buoyancy compensator (BC ) AND a premium SCUBAPRO octopus or Air2 and SCUBAPRO will give you a fully-loaded Chromis or Meridian Black Tech wristwatch-style dive computer, absolutely FREE. This offer includes all current model SCUBAPRO MK25, MK17, and MK21 regulator combinations, either the SCUBAPRO S360 Octopus, the R195 Octopus, or the Air 2, and any SCUBAPRO BC except the Pilot or X One. Offer is valid for qualifying purchases made from Nov 1, 2014 thru Dec 31, 2014 in the U.S. and its Territories and cannot be combined with any other offer. 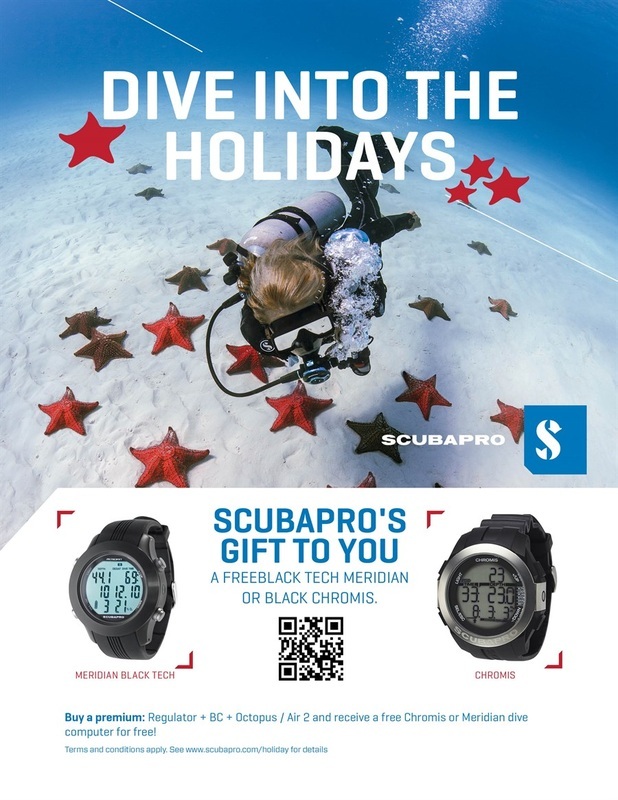 When making your purchase, your local SCUBAPRO dealer will give you your free gift at the time of purchase. Items not in stock will be ordered and provided via the dealer you purchased your goods from. You must purchase one of the premium products in each of the following categories to receive your free dive computer! Once you have purchased one product from each of the above categories, you may choose one of the following products as your free gift. 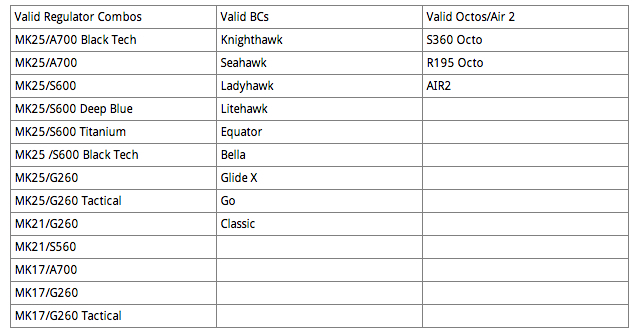 Offer includes all MK25, MK17, and MK21 regulator combinations and either the S360 Octopus, the Air 2, or R195 Octopus. Offer does not include the Pilot or X One BCs. Cannot be combined with any other offer in the U.S. and its Territories. Items must be purchased by the same individual from the same authorized SCUBAPRO dealer. Offer not applicable to prior purchases. Offer only valid on new qualifying purchases made between November 1st and December 31st, 2014. Offer is valid on retail consumer purchases only. Institutional, instructor and dealer purchases do not apply. Offer cannot be redeemed for cash.• For online purchases, additional shipping costs may apply. Purchased product must be the current version available. SCUBAPRO reserves the right to change, cancel or amend offer at any time. Additional restrictions may apply.